The son of Knightcote murder victim Patricia McIntosh has told the man who killed her that he committed the "ultimate betrayal" to both her and her family. At Warwick Crown Court in Leamington today (Thursday May 24), Patricia's estranged husband Andrew McIntosh, 54, a former airline pilot of Woolscott jailed for life for her the murder which took place at their former marital home in Knightcote on the evening of November 15 2017. He will serve a minimum of 17 years in prison before he is considered for parole. When sentencing McIntosh, Judge Andrew Lockhart QC read out a statement from Stephen, Patricia's son from her previous marriage who was present at the court along with his grandmother. Stephen, who had described his 56-year-old mother as "the most amazing person with an amazing outlook and a zest for life" whom he was "so lucky to have had as a mother", described the hardships he and his grandmother had faced since Patricia was murdered. In the statement, he told McIntosh: "You came into our lives and our trust and you made the ultimate betrayal." Stephen said how before she was murdered his mother had been looking forward to him getting married to his fiance and becoming a grandmother. He said: "This is the life you selfishly took. "How you will carry that burden is something you will have to deal with." McIntosh killed Patricia by repeatedly punching and kicking her and also hitting her with a saucepan. He had driven to the house, drunk, seeking to persuade her to drop the asking price for the property which was to be sold as part of the couple's ongoing divorce proceedings. After the attack McIntosh drove back to his home, drank a bottle of wine and left Patricia to die of her injuries. Judge Lockhart said McIntosh, who had been paying maintenance to his ex wife from a former marriage, had been living beyond his means and whose income was about to be reduced due to flights being less frequent in the winter months, had become "obsessed" with the financial situation he was faced with and that there had been a "sinister element" behind the marriage in that he had become overbearing and threatening to the extent that he had to separate from Patricia in fear of what he would do to her. He also highlighted that McIntosh had been violent towards Patricia in the past in that during a row in 2014, before they were married, he had punched her twice in the face. 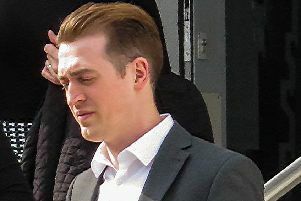 The court had previously heard how McIntosh had suffered from a spell of moderate depression in the summer before the attack but that, as experts had said, he had recovered from this and he had been well enough to returned to work for the TUI airline. Judge Lockhart said: "This was a very violent and very callous killing - a sustained and horrific attack. "And after it, when anyone with an ounce of compassion would have would have sought medical help you closed the blinds and left." And addressing Patricia's family, Judge Lockhart said: "This will be a very raw occasion for you and a very raw period. "I can offer no solace all I can offer is a hope and trust that in the weeks, months and years to come that you will find hope. "There is always hope and I hope you find some closure." The judge went on to praise the Warwickshire Police officers involved in the investigation and said that he would be writing to the Chief Constable to recommend them for commendations. For more on the trial click here , here, here , here and here.